Generally speaking the weather conditions have to be pretty good – especially when you are a student skydiver going through your AFF course. This means only little cloud – because it’s important you can see the ground beneath you so that you know where you are in the sky – and light winds so that your parachute can be maneuvered easily. Qualified, more experienced skydivers can jump in marginally windy conditions. You can technically skydive in light rain – but it is unpleasant to do so and also when it’s raining it tends to be cloudy! British summers are normally better than people give them credit for and it’s a great place to learn to skydive. Modern parachutes are highly maneuverable, you can steer and fly them in whatever direction you like. With a bit of practice you will be able to land your parachute with a great deal of accuracy. This allows you to choose a good, flat place to land which is clear of obstacles. At landing time itself you can momentary slow the descent of the parachute using a manoeuvre called a flare to give you an easy, soft stand-up landing. You will be taught how to steer and land your parachute on your AFF course. First and foremost, modern sport parachutes are extremely reliable and its extremely rare that a parachute “doesn’t open”. Long gone are the days are high-malfuction rates, modern parachutes are incredibly well designed and tested. However, in the rare event of a malfunction all skydivers have a secondary reserve parachute that they can deploy and fly to the ground in exactly the same way as their main parachute. It is mandatory in most countries that all skydivers wear a reserve parachute. In addition to the reserve parachute most skydivers have an Automatic Activation Device installed on their equipment. This automatically deploys the reserve parachute in the event the skydiver is still in freefall at low altitude, i.e. doesn’t deploy their own parachute. Modern skydiving equipment is very advanced. Once I am a qualified skydiver what next? There is always something new to learn in skydiving. Amongst many other things your AFF course will teach you to fall “face to earth” in a stable position and perform turns (rotating your body), but you can refine these skills to enable to to fly very close to other skydivers, around them, towards them, over them and under them – with phenomenal control and precision! 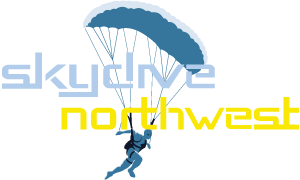 There are hundreds of freefall disciplines to develop and wide range of canopy skills to learn and refine. Many skydivers with thousands of skydives will say there’s still lots of new “stuff” for them to learn and this, in part is why skydiving is such an addictive amazing sport. The best in the sport often choose to compete in their chosen discipline against other at any of the hundreds of events around the world each year. Once you have become a fully fledged licensed skydiver and have gone on to buy your own equipment you can skydive in the UK for around £20 a jump. Is learning to skydive difficult? Learning to skydive is extremely rewarding – many people will tell you it’s one of the most rewarding experiences of their entire life. It’s an amazing sport, with amazing people. However, learning can be very emotionally demanding, stressful and for many people even a little bit scary – but for most people it’s not actually “that difficult” in a technical sense. There are a lot of things you will need to learn and learn well. You will need to be alert and switched on and have common sense, but you certainly don’t need to be a rocket scientist! There are skydivers from every walk of life, from all sorts of different professions and with a wide range of academic ability. Learning to skydive isn’t difficult – but it requires an element of “steel”, alertness and common sense. Most skydivers liken the sensation of freefall to how they imagine flying or floating on a cushion of air. There is no sensation of “falling” as most people imagine and there is no “roller-coaster” sensation! It feels how you might imagine flying to feel. It is however quite noisy and naturally very windy as the air comes past you at great speed. Freefall is a really magical feeling that most people enjoy immensely and many people find highly addictive. Ever seen Superman flying across the sky in the movies? Well, freefall is probably the closest you are going to get. Try putting your arm out of a car window and feeling the sensation of your arm being held by the wind, your whole body will feel like that in the air. The average skydive from 14,000 feet gives you about 65 seconds of freefall!